We grow our natural, wild flowers from March to November on our Devon farm. From Narcissi to Anemones, our wedding flowers are used to create unique, stunning wedding flowers just for you. Our main flower growing season begins in late March when the field begins to burst into life with our Narcissi which fill the air with their intoxicating scent and the promise of long summer days to come. Closely following the Narcissi are the Anemones, glorious tulips and our favourites the ever popular Ranunculus. In May the riot of colour is really picking up with the first of our sweet-peas blooming in the glasshouse and in the field the Peonies are closely followed by our gorgeously scented roses and the cornflowers, delphiniums, larkspur and foxgloves. 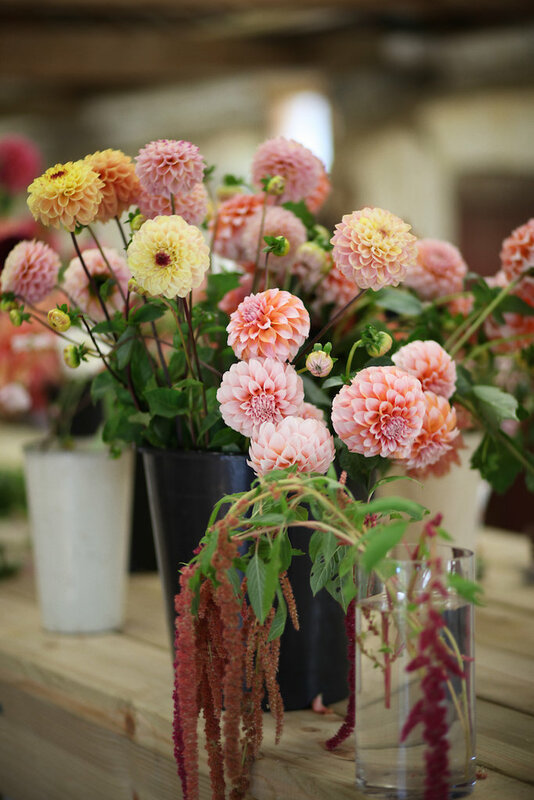 In high summer the fields are an abundance of blooms and colour, the dahlias have begun their long beautiful season along with the zinnias, scabious, cosmos and sunflowers. 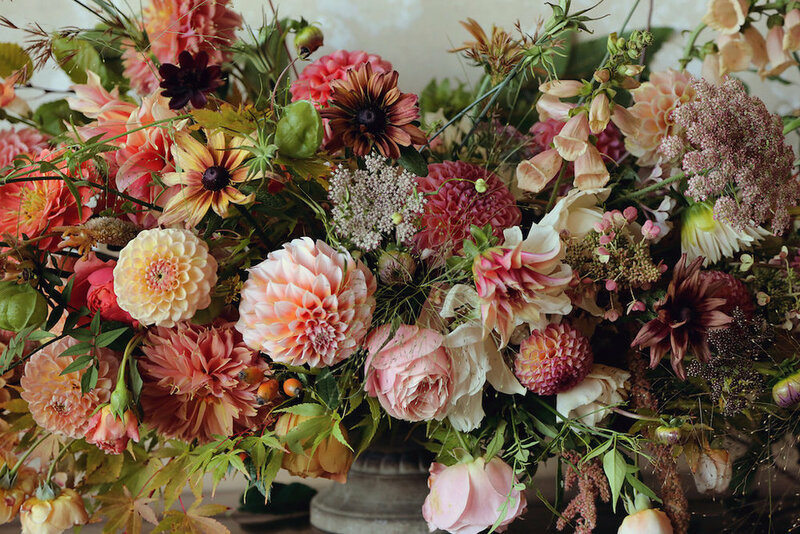 Then we have the finale of Autumn with Chrysanthemums, more and more Dahlias and grasses, berries and seed heads - these all create a different feel but are no less enchanting and individual. At The Flowerfield we only use British seasonal flowers. Obviously we like to use our own grown or foraged flowers wherever possible but sometimes it is necessary it buy in other flowers for special requests, or if the Devon weather isn't playing ball! 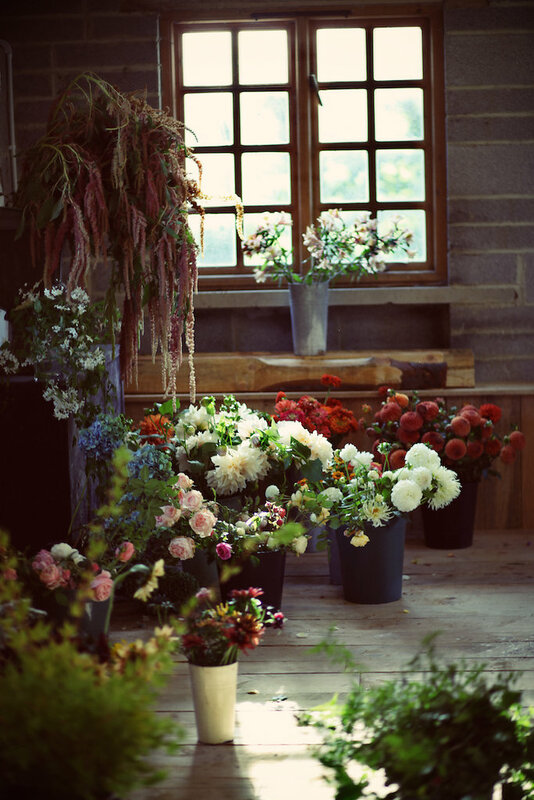 However, you can rest assured we will only use British seasonal flowers in your Flowerfield bouquets and arrangements.